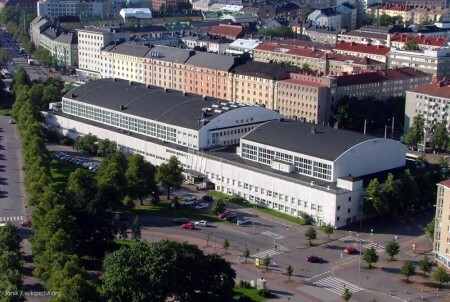 Töölö Sports Hall is where most of the competitive action of the Worlds tournament will take place. Töölön kisahalli, or Kisis for short, in Finnish, it is a former Olympic arena and currently home to the basketball club Torpan Pojat. It offers diverse yet inexpensive training facilities for the citizens of Helsinki, while also hosting national level competitions in various sports such as volleyball, fencing, gymnastics, and martial arts. Töölö Sports Hall photographed from the tower of the Helsinki Olympic Stadium. Photo by Jonik. Some rights reserved. Inside view of the Töölö Sports Hall (A). Click to view full-size image. Inside view of the Töölö Sports Hall (B). Click to view full-size image. Töölö Sports Field (Bollis) is a series of outdoor soccer fields conveniently located just a stone’s throw away from Kisis. It is LIKELY to be the venue of Intermediate Singles and Intermediate Doubles Net, as well as all net consolation matches for the 17th place and below. In case there will be less competitors than the organizers currently anticipate, it is also possible that no matches need to be played outdoors. 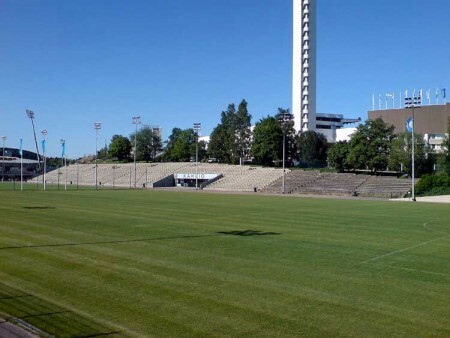 Töölö Sports Field. Photo by Mir1082. Some rights reserved. The locations of numerous sideline events such as the night shred, Big 3, and player parties will be announced later, once they are confirmed. The easiest way to stay up to date, regarding not only the venues but all aspects of the tournament, is to subscribe to the news feed of this site. There are 6 Comments to "Venues"
My friends and I very anxious about watching the matches. Nevertheless we didn’t know about it until today. Would it still be possible for us to attend the event as speculators? For instance, could we go straight to the venue and buy the ticket at the entrance? I look forward to hearing from you and many thanks in advance! You and your friends are more than welcome to the tournament. Just came to Kisahalli and look for the tournament office, and we’ll hook you up with everything you need! Thank for your kind reply. Would it be possible to provide me the phone number of the tournament office just in case? Ilkka, is there a fee to get in? The website does not exactly tell about prices for entry into the competition, could you provide me some details as well? My friends and I also wish to see the competition, but where exactly is the tournament office located at Kisahalli? The entrance is free, and to participate as a spectator you don’t need to visit the tournament office (unless you really want to). There are signs that will guide you to the office if you want to go there.